The Inca Trail is a demanding 4 day hike mostly at altitude through the Andes mountain range which includes high passes – the highest at 4,234m. Although it is a reasonably challenging trek with appropriate training it is a very rewarding experience. 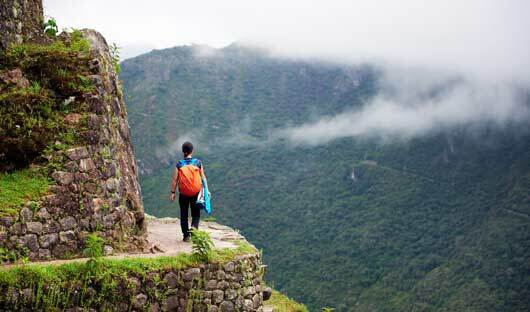 You will see many Inca ruins along the trail that, unlike Machu Picchu, are only accessible on foot. We recommend spending at least 3 days prior to the trek in Cuzco to acclimatise and ensure you have good quality trekking equipment. 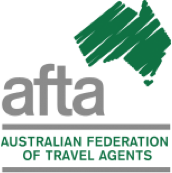 You will be picked up from your hotel early this morning for transfer first to Ollantaytambo. The trail commences Piscacucho initially following the left bank of the Urubamba River, beneath the impressive snow-capped Nevado Veronica through cactus gardens and fields of corn. Porters will carry your luggage and you walk carrying only your day-pack. After a couple of hours you’ll arrive at the imposing sculpted terraces of Inca Llaqtapata (2,650m) where you will enjoy lunch. After lunch visit the ruins of Llactapata before continuing along the valley, gradually climbing until you reach the Indian community of Huayllabamba (2,954m), the last inhabited village on the trail. Camp will be set up by the time you arrive. Enjoy a well deserved meal and share stories and experiences from your day. 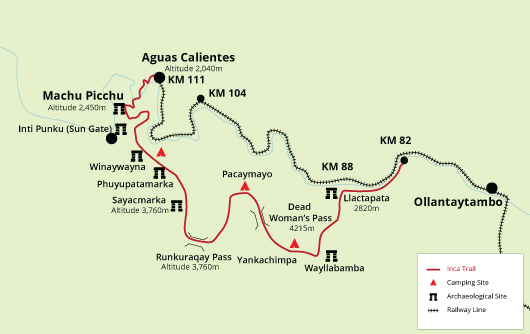 Today is the most challenging day of the Inca Trail hike. After breakfast you’ll begin hiking up a steep incline through fields and later forest. The trail then crosses a small plateau then traverses a more open area with views across to imposing mountain crags. The steady climb to Warmiwañuska (Dead Woman’s Pass 4,234 m) is best taken at a steady pace, it’s not only the first but also the highest pass. From here you will have spectacular views of the trail ahead to the second pass, and look back to the sweeping snow peaks and valleys of the Huayanay massif. Descend to the camp at Pacaymayo (3,613m) in the valley bottom. Overall the Inca Trail is down hill, and you may not believe that as you leave camp and commence the slow ascent past the ruins at Runcuracay (3,800 m) to the second pass (3,975m) from where you can to see the Vilcabamba and Urubamba mountain ranges. After a short rest descend slowly along a paved Inca road to the ruins of Sayacmarca which have been recently restored. Further on you pass through a tunnel amid luxuriant cloud forest vegetation; in the afternoon the trail descends via a stone staircase past the ruins of Phuyupatamarca (3,679m) to Wiñay Wayna (2,550m), the last campsite of the trek. 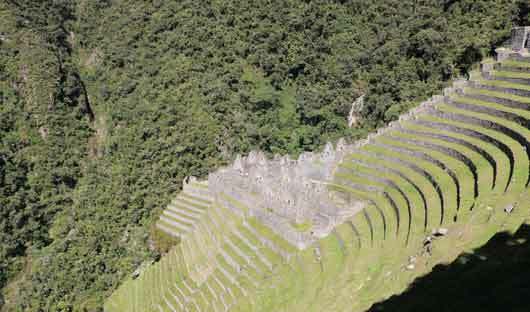 After about 2 hours you’ll arrive at Inti Punku (Sun Gate) overlooking the magnificent citadel of Machu Picchu. 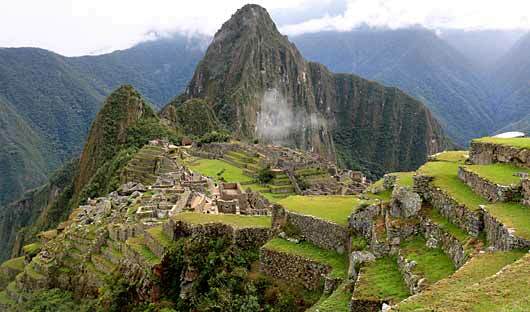 From here you will get your first glimpse of Machu Picchu before making your way down the last part of the trail. On entering the site you will have a guided tour of the temples, houses, agricultural terraces and palaces of this magical place. In the afternoon make your way down to the village of Aguas Calientes to board the train to Poroy, located approximately 20 mins from Cuzco. 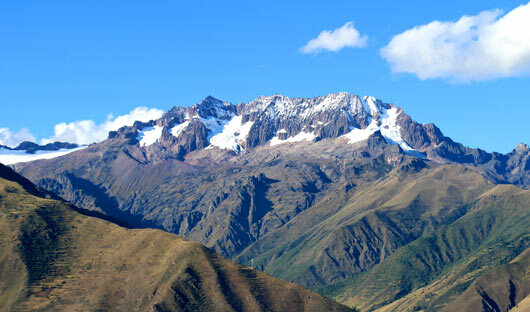 You will be met on arrival at Poroy railway station for transfer to your hotel in Cuzco.